Vederi Estate to kompleks trzech tradycyjnych willi z trzema sypialniami (dwie wille z poddaszem i jedna z sypialnią na parterze z łazienką z jacuzzi) powstały w otoczeniu bujnej zieleni, oferując najlepsze z naturalnego, kreteńskiego stylu życia. Wyjątkowe doświadczenie w wygodnym, prywatnym zakwaterowaniu w ciszy naturalnego parku ze zwierzętami, sadami, drzewami i pobliską wioską, oferując najlepsze dania kuchni kreteńskiej. Posiadłość Vederi, położona wśród gęsto zalesionego dębu i cyprysowego lasu, przenosi historię gościnności i dziedzictwa kulturowego wiejskiej Krety. Miejsce relaksu, kontemplacji, rozkoszowania się przepięknym krajobrazem Krety. Trzy tradycyjne kamienne wille zapraszają przez cały rok, położone zaledwie 6 km od miasta Rethymno i 1 km od malowniczej miejscowości Prines. Bo wszystko, co przychodzi do Vederi Estate, staje się ich drugim domem, ich "jardin sacre". Amazing location and property for a chilled out holiday. We spent a week here as a family of 4 and have nothing but postive feedback from our stay. George the owner went out of his way to make our stay as enjoyable as possible. The house is very clean and has everything you need for you stay. Our boys loved the pool and the local animals that roam around the estate. We ate out most nights either in the local villages or down in Rethymno where the fish was amazing. I’d not hesitate recommending this place to anyone looking for a relaxing holiday. 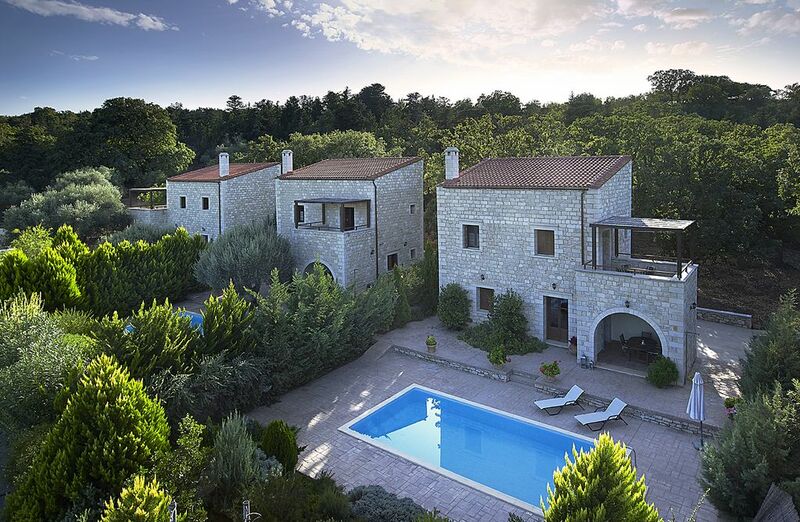 We had a wonderful stay in this beautiful, spacious villa set on tranquil olive groves. The garden and pool area with stunning views over olives and down to the sea were beautiful and well maintained. George made us feel very welcome and Fotini and her crew made sure the villa was clean and fresh throughout our stay. We also highly recommend Maria who is the visiting massage therapist. Thank you so much for your kind review. We have enjoyed very much having you in Vederi Estate and would look forward to having you again any time! This villa surpassed our expectations. It was spacious, and very clean with a beautiful view to the sea and a decent sized pool. The grounds were peaceful and private. Short drive to nearest town where there were good places to eat. We had a superb holiday here, would definitely recommend. Thank you very much for taking the time to review Vederi Estate and for your kind words. It's been a pleasure meeting you and hope to have the opportunity to host you again in the future. Wir können die Villa nur bestens empfehlen! Sehr gute Basis um Westkreta zu erkunden. Toller Service und sehr netter und engagierter Vermieter! Dear Viola, thank you ever so much for your kind words. It is so wonderful to have guests like you in Vederi Estate. You make all the difference! Wir hatten eine wundervollen Urlaub! Das Haus ist wirklich schön und gut ausgestattet, die Bilder entsprechen vollkommen der Realität. George und seine Familie sind fantastische Gastgeber, am Ankunftstag hatten wir bereits alles fürs Frühstück, Obst, Wasser und Olivenöl aus eigenem Anbau (auf dem Grundstück befindet sich ein familieneigener Olivenhain). Eine kleine Katzenfamilie hat uns regelmäßig besucht und auch zwei niedliche Hunde gehören mit zu Georges Großfamilie. Eben pures Landleben. Thank you so much for being so kind. It's been our pleasure hosting you and hope to have you back in Vederi Estate in one of your future travels. Beautiful villa in a stunning setting! We stayed in one of the Vederi villas for 3 nights in July 2017. The booking process was easy and George answered any of our questions very quickly. When we arrived I have to say that the villa exceeded our expectations -it really is beautiful with every amenity that you may need. However the best thing about the villa is its location. It is set in an olive grove and we had complete privacy. There are various seating areas and the balcony affords a fantastic view of the surrounding countryside. Everything is very clean and the bathrooms and showers were top quality. Beds were very comfortable too. The villa is in a quiet area however it is only about 15 minutes drive away from Rethymnon. And if you don't want to go out the local tavernas deliver the tasty Greek food! Thank you so much for your thorough and kind review. We wish too you had stayed a little longer to give us the opportunity to offer you a little more Cretan hospitality as a token of your kindness. It's been a pleasure having you in Vederi Estate and hope to see you back one day. do wioski Vederi. Vederi Estate znajduje się na końcu wioski. Obszar ten ma wiele naturalnych działań, takich jak turystyka, jazda konna i wąwóz Vederi dla żądnych przygód. Vederi Estate znajduje się poniżej małego lasu w odległości 2 km (1 3 mil) od najbliższej plaży i tylko 6 km (3,8 mil, 10 minut jazdy) od tętniącego życiem miasta Rethymno i jego piaszczystej plaży (wszystkie odległości zostały mierzone za pomocą Google Earth).